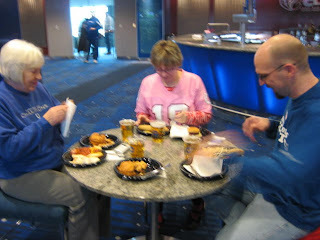 Susie & I went to our first Colts game on the 27th. 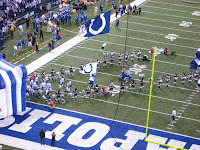 It wasn't the best game to go and see, it was the Colts first loss this season, but it was a fantastic way to see the game. Nancy had received 4 tickets to the game from her daughter Caroline. 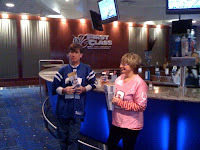 But they weren't just any old tickets, they were tickets to the Quarterback's Suite at Lucas Oil Stadium! 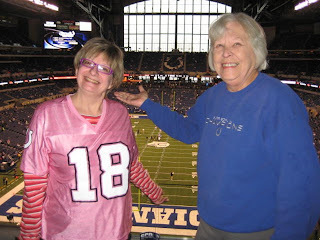 Nancy's friend Nell called her & said she was getting sick & would not be able to go the game that morning, so we suggested that we should give the option to Jon, as he also comes to Nancy's house to watch the games. Needless to say, Jon, who was visiting with family, was beside himself and jumped (possibly literally) at the offer. He could barley sit still in the car on the way down. Approaching the stadium is an awe inspiring experience. It is absolutely huge! Having never been to any other football stadium, I'll go out on a limb and say this has got to be the best there is. We wandered around for a while, searching for the secret entrance to the suites. Then passing several checkpoints to keep the riff-raff out, we came to the floor of suites. Upon passing the final checkpoint, we stepped into the Quarteback's Suite. WOW!The first thing you see is the massive bar, where all the beer & wine is free. TV's everywhere. 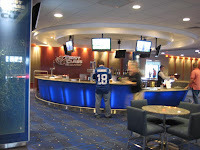 Granite topped tables and 3 food stations. 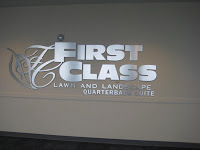 Gourmet all-beef hotdogs, pasta made to order, roast beef on croissant sandwiches, Yankee potroast, Waldorf salad, popcorn, pretzels, chips & salsa. Did I mention its all FREE! This is how to tail gate. After stuffing ourselves before the game, we wandered out to our seats to watch the team's warm ups. There are only 2 rows of seats. Nice cushy leather seats. Susie & Nancy took the front, Jon & I sat behind. 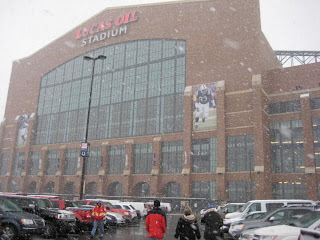 Our seats were at the south end of the stadium, giving as what would have been a beautiful view of the Indianapolis skyline through the north window if it had't been snowing so hard. 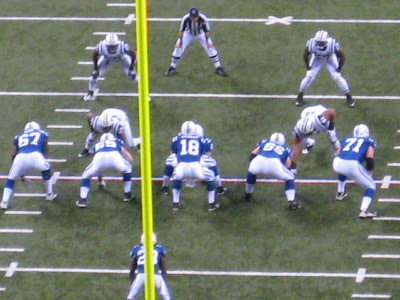 The Colts entered the field just below us. We got to see them getting ready to enter the field through their tunnel as the introductions were made. 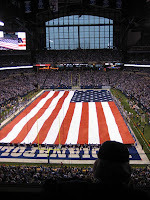 I've heard it said many times that Lucas Oil Stadium is one of the worst places for the visiting's offense to play due to the noise level. They aren't kidding. The noise the twelvth man makes is amazing! I don't know how anything could be heard down on the field. And its really quiet when Payton is on the field. The first half of the game was really good. At halftime it was time to go back to the lounge, load up on some more good food & beer and live the life of the priveliged. We were still sitting at the table when the kickoff to the Jets for the second half happened...and was run back for a TD. A harbinger of things to come. 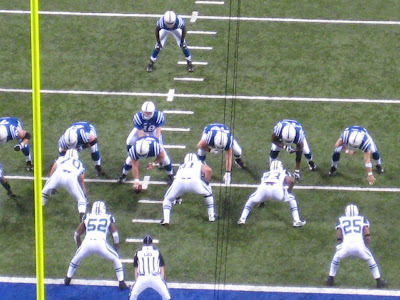 When Manning & the starting offense was pulled out, and Painter and the 2nd/3rd string offense was sent out on the field, the crowd went ballistic. The boo's where as loud as the noise for the Jet's offense. The rest is history. It would have been a perfect ending to a perfect day if the Colts could have pulled off a win, but I'll never forget my day of being treated like royalty at my first Colts game. Phase two of the Great Lager Leap is underway. Today I brewed lager #2, a doppelbock and transfered the "experimental" 3 gallon batch #1 to the secondary. Batch #1 had done its job in creating a nice army of yeast so that the doppelbock can get a quick start. It was put in its new home and sent to the cooler to lager. (That means age at a cool temperature.) It will remain in the chill box in the Tin Whisker for several weeks. It will then be divided into 3 one gallon batches. In batch #1, I will add lime juice in an attempt to make a lime flavored lager. In batch #2, I will add olive juice to see if I can create the beer that Susie says will be fantastic. In batch # 3, I will add nothing. Just to see how my first atttempt at a Lite American Lager comes out. The Brewcat at the Tin Whisker is about ready to make the leap from only brewing ales to making some lager beers. A lager is a much more fastidious beer to make. Requiring paying more attention to temperature and conditioning. The first batch to be done will be a totally experimental beer to satisfy Susie's eccentric tastes. She has the odd habit of adding either lime juice and/or olives to her beer. The lime is something that many mega-brewers have already taken to following the ritual of stuffing a lime wedge in the neck of a Corona. The olive thing is just plain weird. It does make for an interesting science experiment though. The olives will sink to the bottom of the glass, rise to the top like a porpoise grabbing a breath of air, and then sink back to the depths of the glass. It is a beer lava lamp. So the first lager brewed will be a 3 gallon batch. An American light lager recipe that will be divided into 3 separate batches at bottling. One will stay unadulterated, one will get a dose of lime juice and the 3rd will get a shot of (ugh) olive juice. It will also serve as the yeast starter to build up the amount of yeast for the next 5 gallon batch. Lager #2 will be a doppelbock. A BIG lager that should come in around 8%ABV. This is the kind of liquid bread that sustains the monks during Lent fasting.